Destiny, gangsterism and corruption mark the themes of this movie that convincingly imports Sergio Leone into a local setting without compromising its essentially South African nature. This is quite a trick to pull off and director Michael Matthews and scriptwriter Sean Drummond manage it with aplomb. There are gunfights, bar-room brawls and the kind of spare dialogue common to the genre. There are also some stunning images of mountainous frontier territory that are vividly captured by cinematographer Shaun Harley Lee. And then there are a clutch of convincing performances from the largely black cast who are holed up in Marseilles (filmed in and around Lady Grey in the north Eastern Cape), a remote railroad dorp that gets its name from colonial times. Parallels are drawn between South Africa and the old West. As in so many American Westerns, the local people (whether they be Mexicans, American-Indians, poor farmers) are held in thrall by the powers that be, whether they be outlaws, corrupt sheriffs or greedy entrepreneurs. In the brief early scenes it is crooked apartheid-era cops, later on, after independence, the picture is differently dark, with a bent Mayor and local gangsters calling the shots. I have no idea what went through the minds of the director and the scriptwriter, but I would like to think that their borrowing of certain Western archetypes is not just a gimmick, but a genuine attempt to create a parallel between the frontier histories of the US and South Africa. The story, briefly stated, concerns a group of young friends (the “five fingers”) in Marseilles who are oppressed by corrupt white cops. This leads to an explosion of violence in which one of the fingers, teenager Tau (Toka Mtabane), shoots the policemen and flees the area, leaving his friends to their fate. Many years later, after a long spell in jail for robbery, Tau (superbly played by Vuyo Dabula) returns home, to find that things have not improved, albeit the oppressors have changed their skin colour and modus operandi. Initially, Tau tries to keep his head down, calling himself “nobody” (perhaps after Clint Eastwood’s iconic “man with no name”), but soon he finds himself forced to make some serious choices. Among the excellent cast, Dabula gives a nuanced performance as the conflicted Tau, Hamilton Dhlamini is wonderful as “Ghost”, the flamboyantly villainous gangster boss with a sonorous voice to match, and Kenneth Nkosi is empathetic as “Pockets”, the mayor of Marseilles who has to cut too many deals with various devils in order to maintain a comfortable lifestyle. 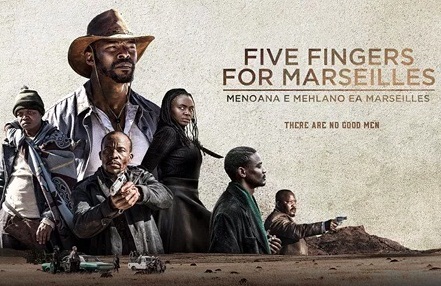 Five Fingers for Marseilles is visually ravishing, in a grim sort of way, and its studied pace (a little too studied at times) enables it to develop characters and their complex relationships as well as some of the pertinent issues that bedevil contemporary South Africa. Cinematically, this is a classy offering that ought to do well on both the local and festival circuits. Dialogue is largely in Sesotho with snatches of Xhosa, English and Afrikaans. English subtitles are used throughout.